Rice University maintains 48 Public Access Defibrillator sites (PAD sites) on campus. These sites are stocked with defibrillators, devices used in the event of a cardiac arrest. Defibrillators can analyze a person’s heart rhythm and decide whether or not to apply a shock accordingly. 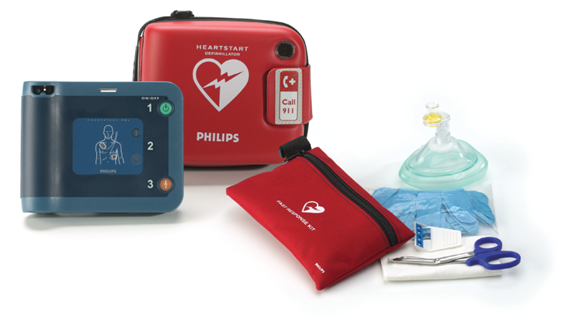 Our PAD sites supply Philips HeartStart FRx defibrillators and other equipment and are available for public use when necessary. These sites can be found in high-traffic buildings. If the interactive map is not appearing, make sure you are not signed into your web browser with your Rice email. You can follow this link to open the offline map. AEDs are meant to be user-friendly so that any bystander can operate it. Pressing the power button activates the AED. The AED will then provide you with all the necessary instructions. We highly recommend taking a free CPR course to practice using an AED and learn proper CPR. Sign up for CPR classes here. Finally, we want to remind you to please have someone else call Rice EMS at 713-348-6000. Though many of our cabinets have automatic alarms, without help from you and other bystanders, EMTs responding will not be able to find the patient. In addition, calling RUPD allows EMTs to get additional information about the emergency, and can speed up the arrival of EMTs and the ambulance.